Feel like you need some extra powers to help with that upcoming test? Or how about that new move you're working on? Try making a cool amulet! In ancient Egypt, amulets ranged from elaborate carvings to simple messages written on a piece of stone or a scrap of papyrus. Amulets were worn to heal an illness, protect the wearer against danger, or to help them make it through a difficult time. How? A person made an amulet by writing down a spell or wish. It was then knotted to a string and worn around the neck. Some people simply wrote their spell on a stone, and others wrote it on a sheet of papyrus and rolled it into a small scroll. 1. Think of a good wish or spell. • To do well at a contest. Using either white or colored paper, cut out a 3-inch square. Write your wish on your square. You can use colored pens, and you could even add glitter. 4. Add extra ancient magic! 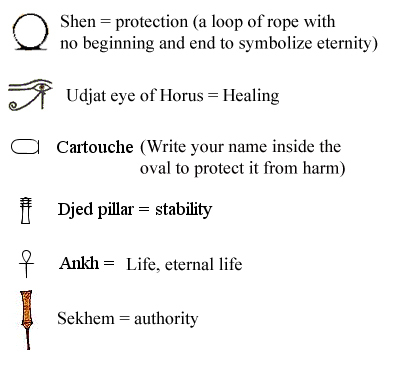 Draw one of these symbols on your amulet. 5. Roll it up into a tiny scroll. 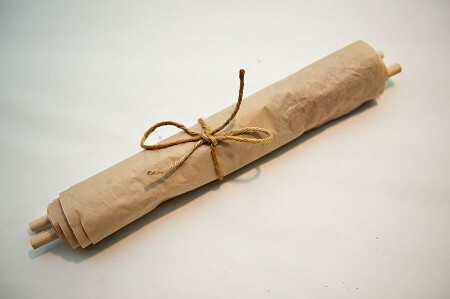 Here's a really old looking scroll for inspiration! 6. Wear it, or put it someplace special. Using a piece string or twine, or even a piece of colored wool, wind the string tightly around the spell. Then fasten it around your wrist, ankle or neck. You could also put the amulet in a special place instead, like a small jewelry box. Remember, magic spells should only be used for good!